(Nanowerk News) Wind turbines began cropping up across the landscapes of Spain and Germany in the 1990s’. These two countries have the highest wind energy production in the EU. But according to the Global Wind Energy Council, the global installed power capacity in Europe — which is 134,007 MW — has been surpassed by Asia with 141,964 MW, at the end of 2014. The wind power industry is arguably the most mature — and fastest developing — among renewable energies. But, there is still considerable room for improvement to compete with other sources of electricity. Even though energy distribution and management, play a crucial role in wind energy uptake across Europe, reducing cost – by relying on research and development (R&D) – is of the challenge currently explored. For example, this is the aim of the European research consortium WINDTRUST. 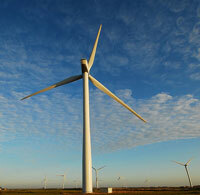 The project plans to reduce costs by improving the reliability of key components of the turbine. “We are focusing on further enhancing the design of three key components with high improvement potential: the rotor blades, the power electronics and the wind turbine controller,” says Mauro Villanueva, director of technology development at Gamesa, the wind turbine company that leads the consortium, who is also project coordinator. One avenue of research has been to aim to improve the durability of turbine rotorblades. “We have already begun to optimise the use of carbon fibre to increase rotorblade durability and reduce component weight. This will contribute to extending the overall life of the turbine to 20-30 years,” says Fernando García Ayerra, a project manager at Gamesa and technical director of the project. Developments are also underway to enhance turbine control. “At the same time, we are developing control algorithms that should reduce extreme and fatigue loads of the turbine in order to maximise the balance between energy production and machine life,” says García Ayerra. But reducing energy costs is not necessarily about making each component cheaper. “Although the cost of the enhanced parts will probably be higher, reduced cost of repairs and less downtime will render an increase in the amount of energy produced,” Villanueva notes. “This increase is expected to exceed such costs, thereby leading to an overall reduction of the cost of energy,” he adds. There are plans to test all these new technologies together. Such innovative components are likely to be fitted onto an onshore 2 MW prototype turbine located at the experimental Alaiz Windfarm in Pamplona, Spain. “This will enable us to compare the performance with those of existing, well-known turbines. And although this project is aimed at onshore, most of the results are also applicable to offshore, where much greater benefits should be obtained,” explains Villanueva. This could also matter for the consumer. “It is important that people understand that all the money invested in R&D is focused towards the reduction of the cost of wind energy, which will hopefully reach the final consumer,” Villanueva notes. What does the future hold for wind energy generation in terms of adaptation across Europe? Villanueva believes: “the creation of a truly European energy market and system, that is, pricing, transport and management, will allow the maximum deployment of sustainable energy generation sources”.